How to play on the river is both a complex topic and a simple one. It's complex because building a plan over multiple streets including flop, turn, and the river is tough to get right. It involves taking into account bet sizings across those streets, relative to stack depth. It also involves considering how our opponent&apos;s actions across those streets define their range. That is to say, how can we narrow their possible range of holdings, based on their actions across this specific runout, and also based on any other information we have, such as their tendencies, their view of us, our relative positions, stack depths, and the stage of the tournament. In this sense, getting the right frequency of betting or checking river can be considered one of the toughest things to get right in poker. In another sense river decisions, at least when considered in isolation, are simpler than decisions on earlier streets post-flop. This is because when we are betting on the river we don&apos;t need to consider implied odds on future streets, as there are no future streets! We don&apos;t have to consider what cards might come up, and our chances of hitting something on future streets. It&apos;s all about this moment, it&apos;s virtually the last bet that can go in (apart from a possible raise from our opponent). In this sense, several reasons we might have for betting on earlier streets go out of the window on the river. We no longer care about charging equity, that is to say, we don&apos;t care about folding out (or at least charging a high price to continue) those hands in our opponent&apos;s range which might hit a card on later streets. We only care about either getting value from worse hands or folding out better hands, depending on whether we are playing for value or bluffing. Semi-bluffing is no longer a part of the game on the river. You're heads-up, it's checked to you. Do you bet? Against somewhat decent competition, the answer is "no". A worse hand will not call here, and a better hand will not fold. You also have showdown value, meaning that it is still reasonably possible that you can win at showdown once you check back. Of course, if you're playing truly awful opponents, it's possible that you might get called by something like Ax because they want to "keep you honest", but don't count on it. It&apos;s possible you could occasionally get called by a worse 6x hand, but it&apos;s unlikely. It's also worth bearing in mind that it's not sufficient for betting for value that you know you will occasionally get called by a worse hand. It needs to happen sufficiently more often than the times you get called by a better hand, for the bet to have value. For example, if you bet 1000 chips and get called 1 time in 10 by a worse hand, but the other 9 times out of 10 you get called by a better hand and lose the 1000 chips, you losing 9000 chips for every time you gain 1000. This is known as value owning yourself. If you get called, you will probably be beat. When that happens, you will regret betting. If you bet, and your opponent folds - did you really gain anything? No - he most likely had the worse hand anyway, and so if it had gone to showdown, you would have gained the same amount anyway. 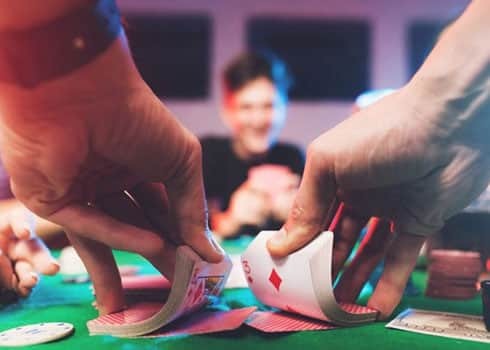 This is a situation where you, in most cases, will simply not gain anything from betting, but you stand to lose one big bet most of the times you get called. If you're betting a legitimate hand, ask yourself these questions: Will a worse hand call? Will a better hand fold? Will you win the majority of times that you're called? Against so-called "Calling Stations", players who are very passive post-flop and will call down with any piece of the board, you should be much more inclined to bet the river with decent - but not monster - hands. The answer to the question "will they call with worse hands?" so often comes up as "yes" that it becomes worth it to bet for value with mediocre hands. This is related to the concept of betting for thin value. Betting for fat value is betting in any spot where it is easy to see many worse hands calling you. Betting for thin value is betting for value in a spot where you judge that your opponent will call with worse holdings just often enough to make it an overall profitable value bet. Your opponent is a competent regular and you started the hand UTG+3 vs. BB and continuation bet half pot on the flop and got called, the turn went check/check and your opponent has checked to you on the river. You decide that he will call with several worse combinations of Qx including QTs and Q9s, probably Q8s. You think he will sometimes call with a worse pair hand such as 99 or A7s, and that it's likely he would have led out on the river with most of his two pair combos or better (those which beat the 2s on the table), and with better Qx, at least the majority of the time. For those reasons you feel that he will be calling with worse hands more often than he calls with better hands, and you will therefore not be value owning yourself when betting for value, and you proceed to do so. Bluffing on the river is another big topic which we will save for another article! If for value, what worse hands are calling you? If as a bluff, what better hands are folding to the bet? Don&apos;t value own yourself going too thin for value! How does villain perceive your range? Is he even thinking in ranges? What range of hands does villain get to the river with?